Address: Playa del Inglés, s/n, Valle Gran Rey (La Gomera), Islas Canarias. 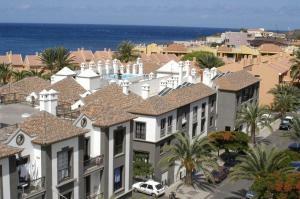 This complex with swimming pool lies in the Valle Gran Rey area of La Gomera Island, 100 metres from La Calera Beach. All apartments feature satellite TV and a coffee maker. The apartments at Las Mozas come with a kitchenette with a fridge, a safe and a spacious living/dining area. They have 1 or 2 bedrooms and a bathroom. Bicycles and cars can be rented at the 24-hour reception, with tour desk. Guests can enjoy meals at Hotel Playa Calera, situated next to Las Mozas. There are also many supermarkets, shops and restaurants within walking distance. Playa del Inglés is just 500 metres from the Apartamentos Las Mozas. The seafront promenade is only metres away. This property will not accommodate hen, stag or similar parties. Please note that reception is located in the Hotel Playa Calera, beside the apartments. Breakfast is also served here.